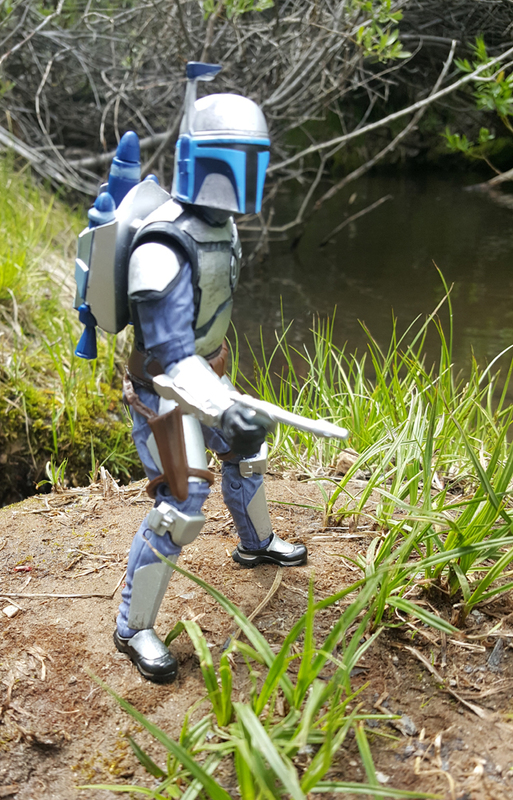 I have been doing digital photography of action figures for many years now. I do it for fun. It’s a nice creative outlet that tends to cheer me up when I am feeling down. I actually did an online comic series with action figures called Landsknechts Gone Wild! It was a story about office frustration and what would happen if 1500’s mercenaries showed up and how they were not like the modern world. It was silly, but I had fun doing it. My husband helped me with some of the set creation. http://www.observationpost42.com/html/year_2008.php I did this for five years until we moved and had no space for the massive setup process. 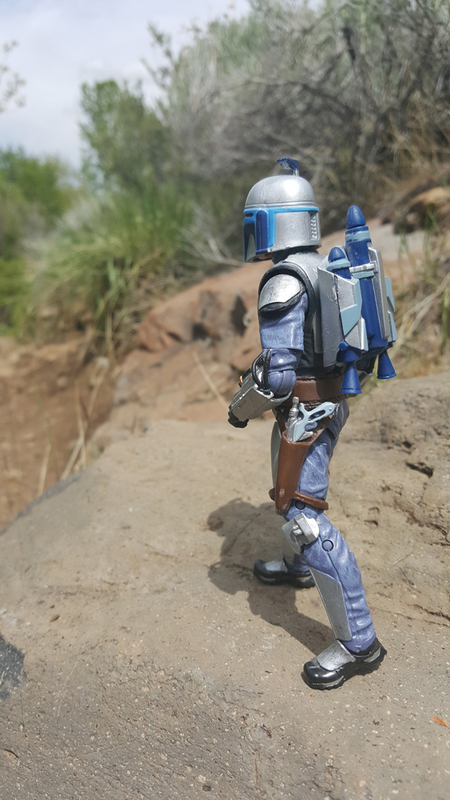 So I have a love for Star Wars and my husband likes to collect action figures, so we started collecting the 6 inch Hasbro Black Series. These figures are nicely made. Some have better posing powers than others, and I think that is natural considering all the different types of clothing and gear that the characters wear. Some figures I tend to use more often than others. 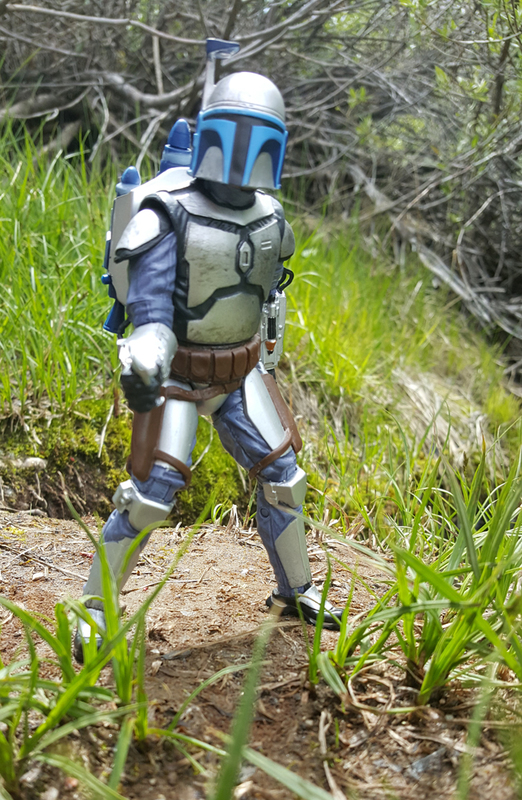 So the other day I took Jango Fett with me on a hike. I will do this once and awhile for fun to encourage me to think….there is a problem solving process that happens when one stages these figures for photos. 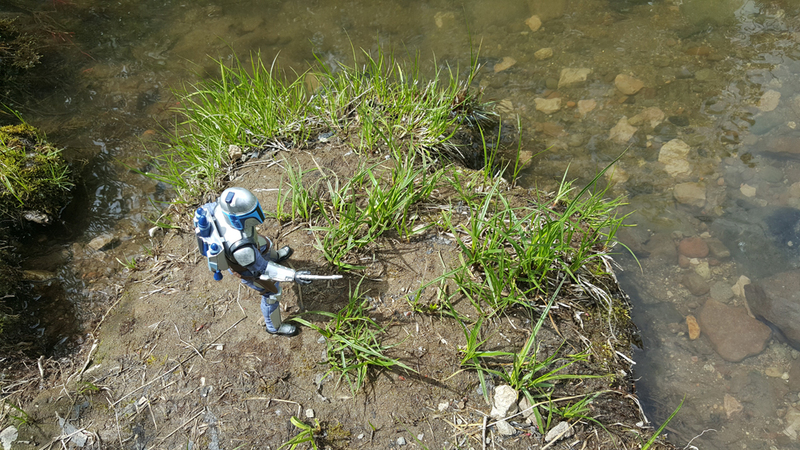 The goal is to make them look realistic like these fit in with the natural setting. I think this is a process that every movie director must go through to create an illusion of certain events. So, one needs to be mindful of objects that will break the illusion. This may require proper placement and angle or sometimes simply cropping out the offending object, but sometimes that’s impossible. Planning ahead is better. It’s part of the composition process that all artists have to do to make good artwork. 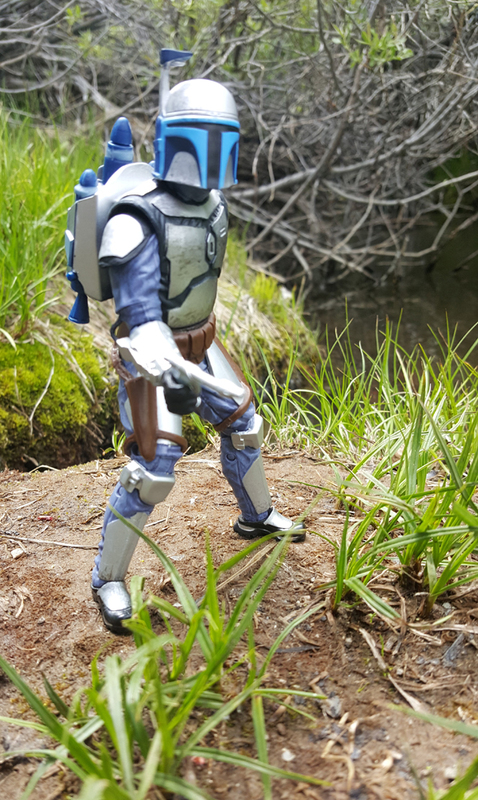 So I thought I would share some of the photos that I got of Jango Fett. 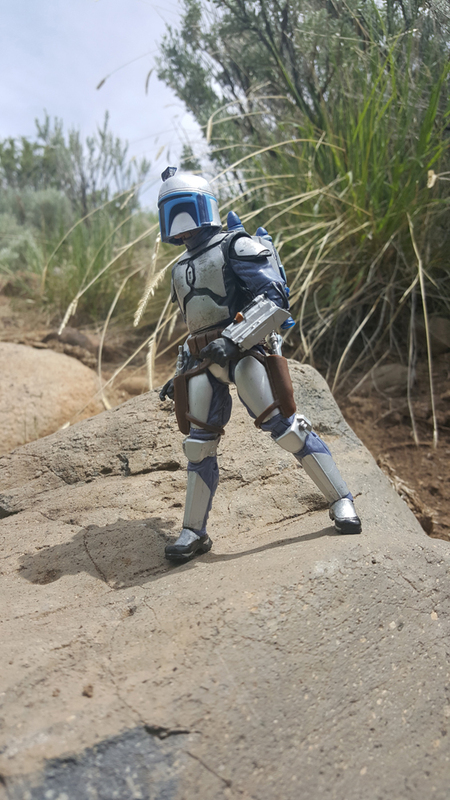 Jango looks pretty good on this rock, the background is blurred so that helps to take the attention away from recognizable plants such as sagebrush, which could ruin the illusion. His shadow looks nice and in this photo his pose makes you wonder what he is focusing upon. Don’t be afraid of closeup shots. So often we take family photos that are too far away. I like this shot, but…. 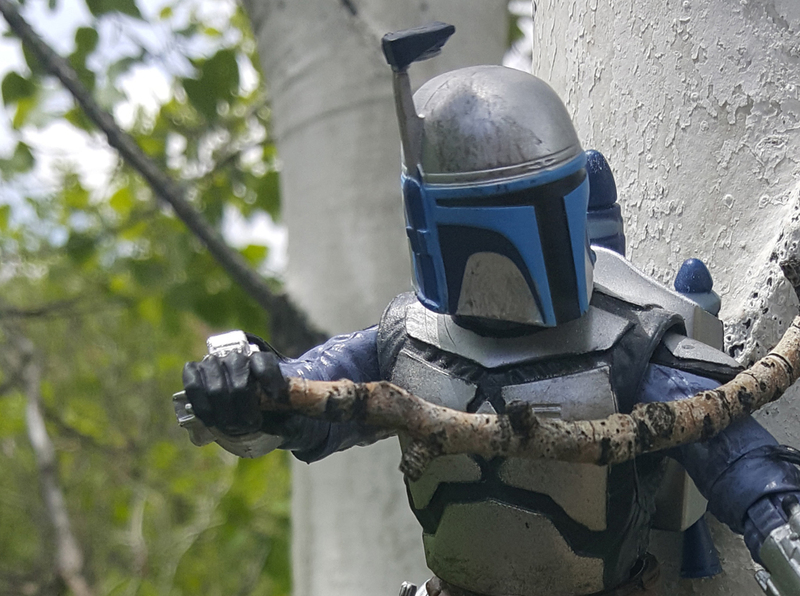 the helmet seems a bit blurry and the angle and lighting of his gun hand completely hides the weapon. These strange things happen that are not always noticeable out in the field. It made a great picture into an okay picture. At least in my opinion. 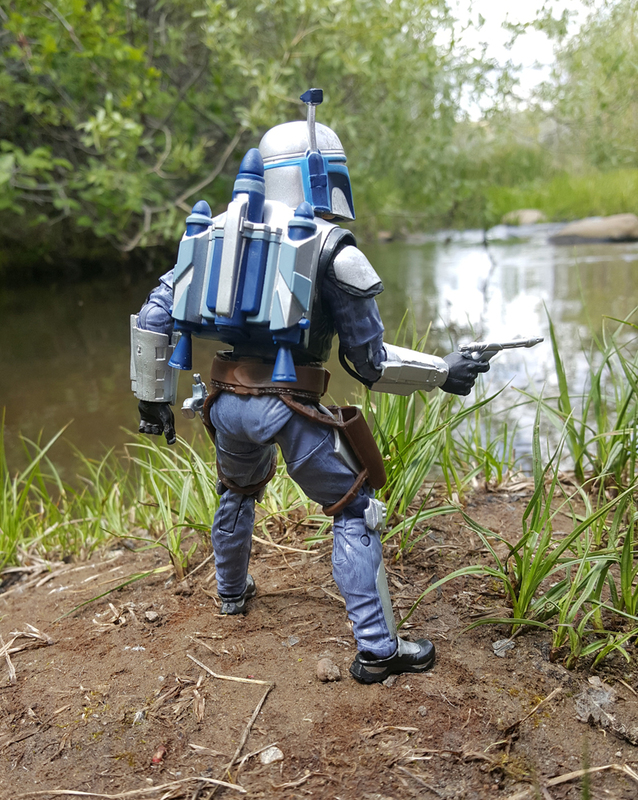 I really like this shot and I did it on purpose….but can you see that Jango has a little visitor? I had to be really quick. And I am not the best photographer with my cell phone. Everything looks pretty believable in this photo, and he has a fun action ready posture. 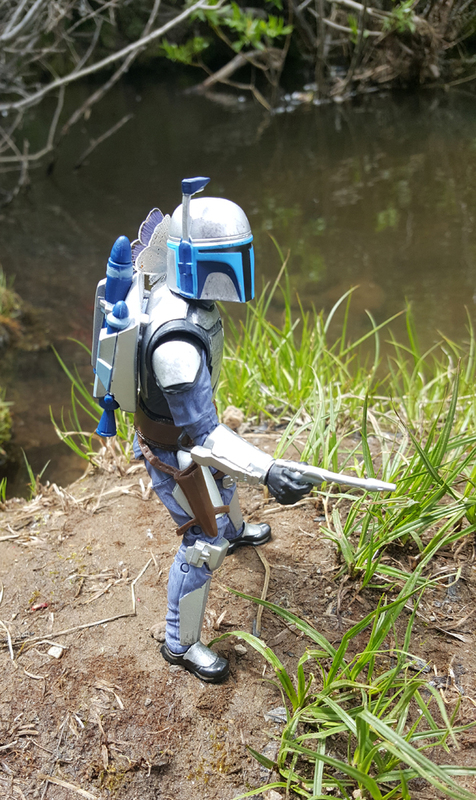 You can see all his gear clearly and the small blades of growing grass seem plausible. Still trying to get that facing forward shot but the gun and helmet seem blurry or perhaps washed out. Maybe some work in Photoshop would help….tried lowering the brightness level and increasing the contrast….it did not make it any better. Professional photographers will take many multiple shoots of the same view to try and get that perfect moment right. Also action figures can act like tiny drunks and fall over a lot! One more try…and the laser pistol is still blurry. Oh well. I can’t let this get me down. I can always try again some other time. This is part of the journey of learning how to take good images of objects or people. Well, I hope you have enjoyed my photos of my hobby. And yes, I took all these pictures with a cell phone camera. Perhaps you will find something that inspires you to take fun little photos to share with friends.